Aarrrghhh! Vegetables! Why ye stinkin’ scallywag! Why in Calypso’s name would ye serve the App Pirate those leafy, green, and tasteless things. I swear, if ye weren’t a good cook, I be choppin’ yer head with me trusty cutlass right now! Sorry about that, I be hatin’ vegetables, that’s all. We pirates only eat meat, bread, and potatoes. 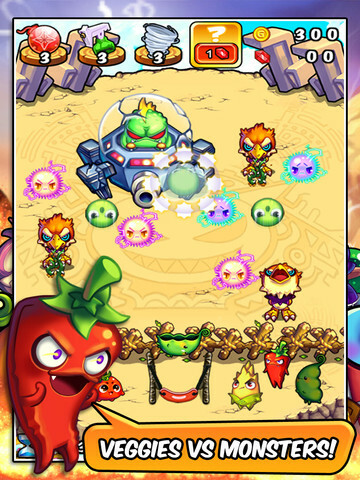 Veggies should always be thrown out and used as cannon ammunition just like in this app called Grow Away! Grow Away! is one of the freshest new apps that came out in the last quarter of 2012. The whole story and idea behind the game is pretty unique and somewhat fun. Imagine throwing all kinds of vegetables via a catapult towards your enemies. Fun, right? Well, that is Grow Away! in a nutshell. Grow Away!’s story is rather simple. It is veggies VS monsters. 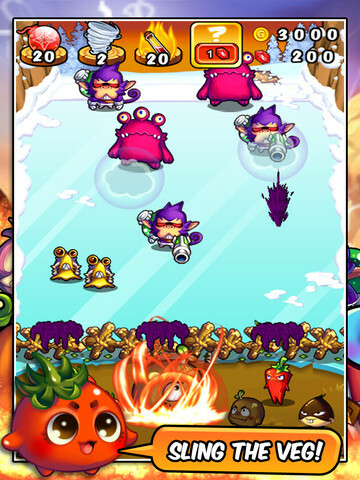 In this app, monsters are planning to invade the homeland of a bunch of animated vegetables. Unfortunately, these veggies don’t know how to fight and defend their homeland. Luckily, they have you as their general. They have entrusted you with the defense of their homeland. Fortunately, all you need is a catapult and a steady supply of deadly veggies. By slinging all kinds of veggies, you can destroy the enemy before they reach the gates, so to speak. From Tomatoes (which is pretty strange considering that Tomatoes are fruits) to huge pumpkins and fire-laden chili peppers. Yes, the veggie community has got your back by supplying your catapult an endless supply of ammunition. All you really have to do is load the vegetable on the catapult, target, pull back, and shoot. Oh yeah, sliding your finger back will retract the catapult. Lifting your finger catapults the veggie into the air and onto your enemies. Now, at the beginning, your only choice for ammunition is the tomato. And for the initial attacks, a few tomatoes flung will do nicely. However, as you move through the stages, you will find that some monsters have wizened up in their attacks, shielding themselves against your tomatoes or having moving bigger ones head up the attack. These require multiple hits or more powerful veggies. Pumpkins are great for inflicting splash damage while chili peppers provide a fire-based oomph to the attack. Grow Away! has 4 worlds. Each world have several stages. Complete those stages and you will eventually come face to face with a boss. Each world has one. In order to defeat the boss, the consumption of power ups that will either multiply your inflicted damage or increase the area of effect from a flung veggie for a given time period is going to be critical. Use the coins you collect in each fight to purchase these power ups and use them wisely. Grow Away! is available for free on both iOS and Android devices. It has superb graphics, a fresh concept, and pretty much provide a bug-free, fun, addictive experience. If you want instant entertainment, this is definitely a no-brainer.